Imagine living in a mushroom. Not like a Smurf’s colorful toadstool abode, but a house built from bricks made of a mushroom’s underground root-like fibers, called mycelium. No need for screws and nails: the mycelium bricks send roots into each other to weld themselves together. To fix a hole, just add water and wait until it patches itself up. In the wild, mycelium creeps through the soil to form vast underground networks of tendrils. 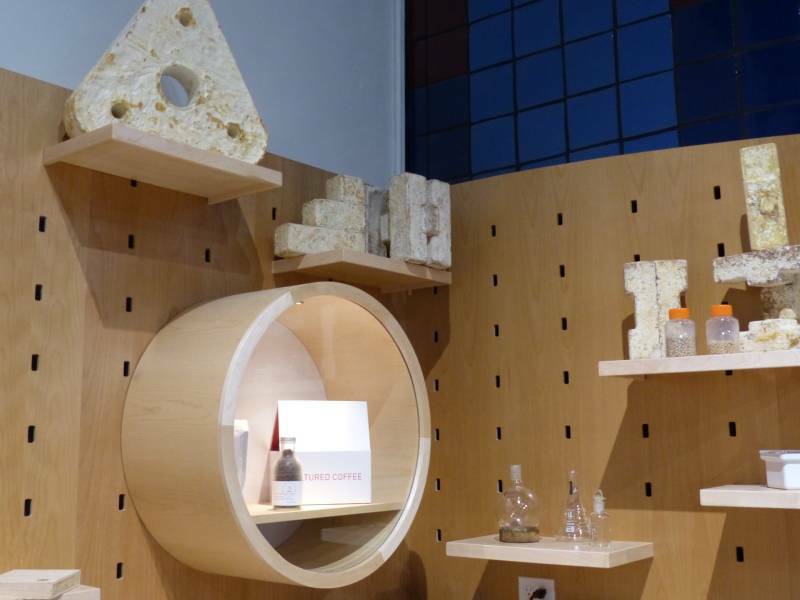 Biodesign engineers are using mycelium's natural talents to come up with sustainable packaging materials, furniture, even living bricks that could form the walls of your house one day. 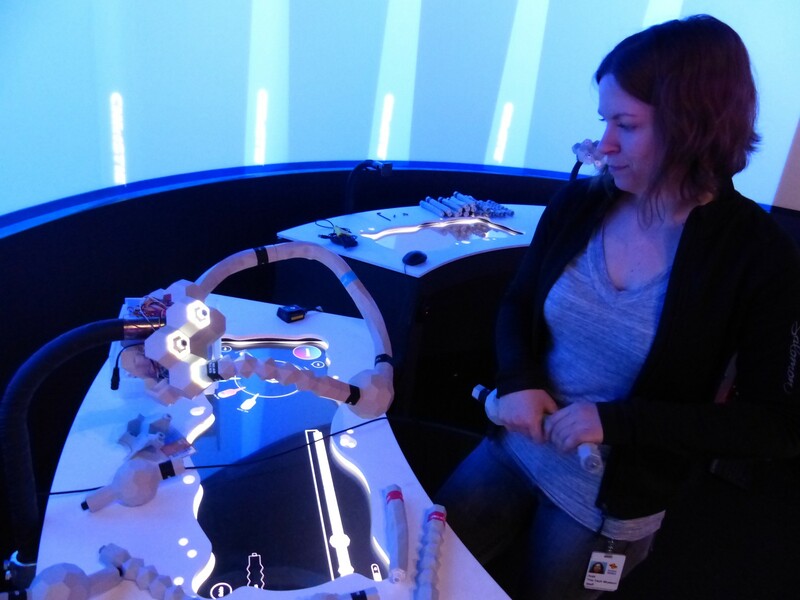 The Tech Museum of Innovation in downtown San Jose opens a new exhibit today called BioDesign Studio where visitors of all ages can wander through a hands-on series of labs. Visitors can design new patterns of fur, create the genome of a virtual creature, mix DNA to engineer colorful bacteria, and grow their own mushroom bricks in a hands-on biotinkering lab. “Biology is a tinkering science,” says Romie Littrell, curator and director for health and biotech projects at the museum. "You can tinker with it to make new discoveries." In a patterning station, visitors see how nature's designs emerge from the information held by millions of tiny cells. Littrell demonstrates how it works by dragging his finger across a touch screen, making small changes in virtual fur cells. As the cells grow, intricate patterns of colorful spots emerge across a real-world bear sculpture. Once you program the information, nature takes over and builds on itself in ways you can’t always predict, a lesson Littrell hopes visitors take away from the exhibit. 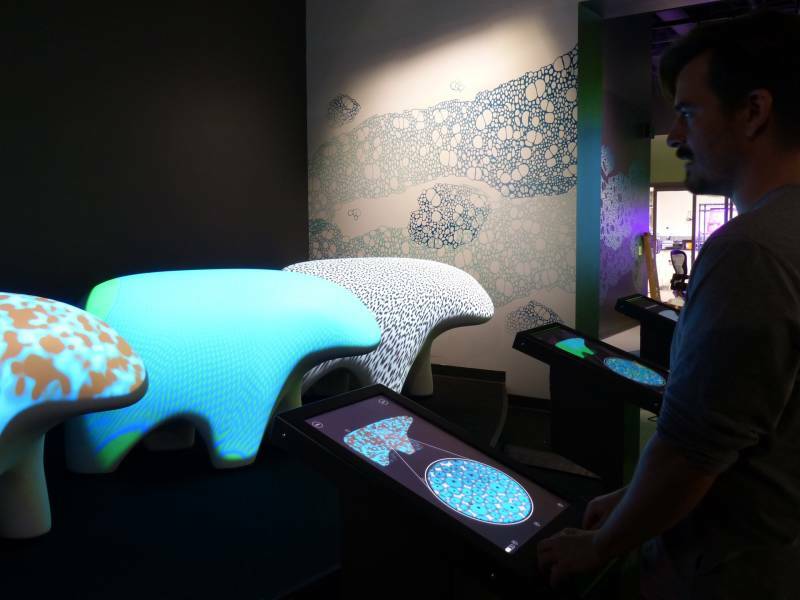 The exhibit’s biggest hit is the Creature Creation Station where visitors design the genes of a virtual critter, then let it loose into a virtual world filled with other museum-created creatures. The visitors act like bioengineers to build a 3-D model of their critter’s genome. The pieces are stand-ins for DNA, proteins and other molecular machinery that sense and respond to changes in the environment. The workbench is littered with gray tubes of flexible electronics, each labeled with ‘genetic instructions’ that the creature has to follow: the “When,” the “What" and the “How much.” For example, say you put together the following pieces -- when near strangers, spew blue, a lot of it -- your creature will emit blue light when it bumps into an unknown creature. Visitors watch their critters interact in a virtual world on a 30-foot screen covered in hundreds of organisms of all shapes, sizes and colors bumping into each other, sticking together, spewing colors, and nearly endless combinations of other behaviors. One of the disparities between tech and biology is that biology is a lot slower. (Yes, even slower than a system upgrade.) Visitors can see s-l-o-w in action when they engineer the genomes of real E. coli bacteria to glow with color. You mix the bacteria with DNA strands that are genetically coded to grow green, blue, and red under ultraviolet light. But not just plain green, blue and red -- the blend of colors and the precise hue will be different every time -- maybe olive green, indigo or magenta. To get the DNA into the bacteria cell (you didn't think the E. coli just opened up and swallowed it on its own, did you?) you heat the mixture. The heat thins the bacterial membrane so one piece of DNA can pass through. A few days later, you can search for you petri dish online to see what color came up. Meanwhile, you can take a look at the dishes other visitors left before you. The designers hope the exhibit gives visitors the confidence to believe that they can make biological designs to address the world’s problems. They provide real world examples, such as genetically engineered mosquitoes that stop the spread of disease. “It’s a place where visitors can play with biotechnology and be inspired,” Littrell says. "Especially for some students, having a creative capacity to redesign creatures might be an inspiration that they will build on in their school or work life." Or maybe someday they'll build your mushroom dream house.